You all know that I love to experiment with nutrition plans and report back to you with what I learn. One of the big takeaways I've had with my time doing keto is that it is really important to not live off of processed foods like cheese, sausage, and dairy. I get much better results and my body just seems happier in general when I'm eating real whole foods that fit into my ketogenic game plan and my guests this week are experts in this exact topic! Christine Moore is a Nutritional Therapy Practitioner who specializes in real food-based low-carb, high-fat, ketogenic nutrition. She works diligently to get to the underlying issues in your digestion, gut health, blood sugar and insulin levels to optimize your health nutritionally in the most natural way possible. Jimmy Moore catapulted onto the health scene in 2004 after a phenomenal 180-pound weight loss enabled him to come off of prescription drugs for high cholesterol, high blood pressure, and respiratory problems. He is the energetic personality behind the top-ranked iTunes health podcast, The Livin’ La Vida Low-Carb Show. 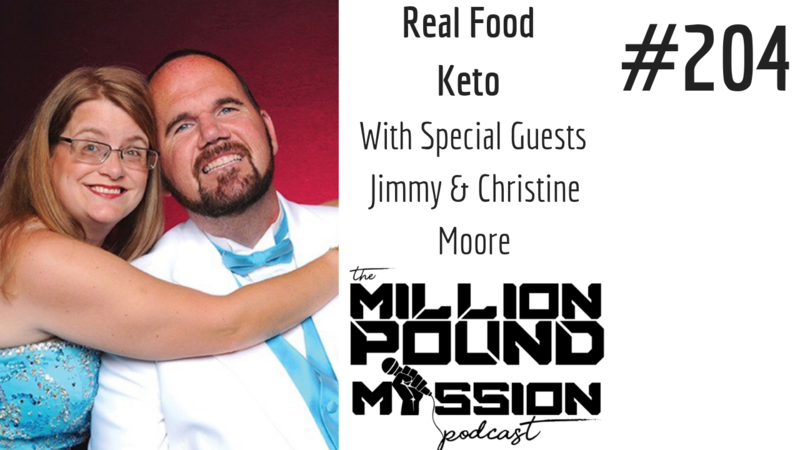 Jimmy also hosts three other active podcasts Keto Talk With Jimmy Moore & Dr. Will Cole, The Nutritional Pearls Podcast featuring Christine Moore, NTP and Jimmy Moore, and The Ketohacking MD Podcast with Dr. John Limansky. He has interviewed over 1500 of the world’s top health experts and has dedicated his life to helping people get the best information possible about living healthy so they can make the right decisions for their health. He is the international bestselling author of The Keto Cure, The Complete Guide To Fasting,The Ketogenic Cookbook, Keto Clarity, and Cholesterol Clarity as well as his latest release Real Food Keto with Christine Moore. How their adventures in dieting eventually led them to their low carb lifestyle. The first time Jimmy felt like he was a "normal" size after his massive weight loss. Their definition of "real food" when it comes to keto. Some of the biggest keto/low carb mistakes they see people making. How to cure common keto issues like irregular heart beat and digestion issues. How to handle the situation where our doctor wants to put us on cholesterol meds when we are on keto.